At 61 Dental our whole team is committed to providing the highest standards of care and the best treatments available in modern dentistry. We welcome new patients of all ages, and whether you come to us with a specific issue or for a standard dental check-up, we will take the time to get to know you and your individual dental health needs. To book your first appointment, telephone the practice on 0161 428 2447 or come in and talk to our reception team. 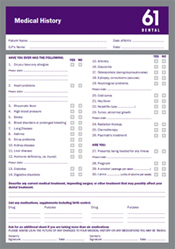 For all patients we take a full dental and medical history – you can download this form from our website and it is helpful if you can complete the form and bring it with you to your first appointment. When you come in for your first appointment, your dentist will perform a full, thorough check of your mouth, looking at your teeth, gums and surrounding soft tissues. We will also take x-rays and use advanced technologies including miniature intra-oral cameras and operating microscopes to diagnose any hidden problems as early as possible. With our dental check-up an oral cancer check comes as standard. Oral cancer can develop in any part of the mouth and is often diagnosed late, which reduces the chances of successful treatment. As with any form of cancer, early diagnosis is crucial, and if your dentist spots anything suspicious you will be referred to a hospital consultant for further tests. That's another good reason to maintain regular dental check-ups. Once your check-up is complete your dentist will discuss the findings with you and any treatment you need will be presented to you in the form of a personalised treatment plan, taking into account such factors as your personal preferences and costs. For more advanced cases you may also be given a written report, and when you're happy we will provide you with a definitive treatment plan including estimated costs. After completion of an initial recommended treatment course, patients will be eligible to join our Dental Care Plan.